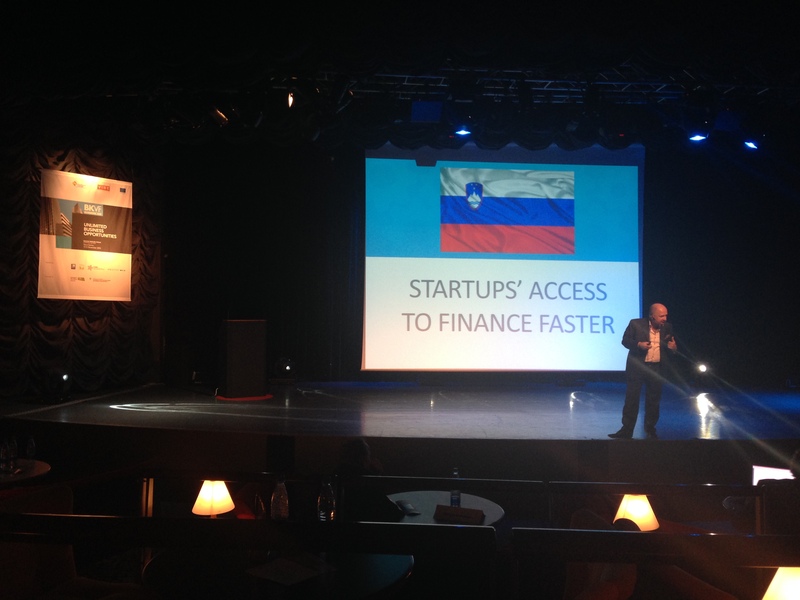 Invited by Balkan Venture Forum, I was in Nova Gorica – a border city of Slovenia and 1 hour away from Venice, Italy – as the Vice President of EBAN on the 12th of November to give a keynote speech on converting public funds to smart funds. I was also invited to a high-level policy meeting on Promoting Equity Investment in South East Europe to explain the best practices in the angel investment ecosystem of Turkey. By the way, this was the first time for me to spend a lot of time in a casinoJ. If you want to learn what happened in the casino, then go on reading. Slovenia covers 20,273 square kilometers (7,827 sq. mi) and has a population of 2.05 million. It is a parliamentary republic and a member of the European Union and NATO. 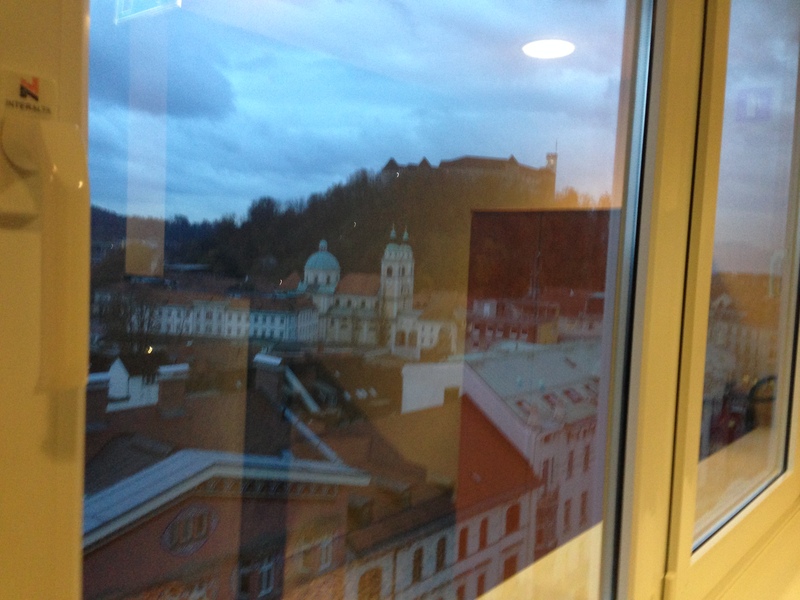 Its capital and largest city is Ljubljana. Slovenia is among the European countries with the most pronounced population ageing, ascribable to a low birth rate and increasing life expectancy. Almost all Slovenian inhabitants older than 64 are retired, with no significant difference between the genders. The working-age group is diminishing in spite of immigration. The proposal to raise the retirement age from the current 57 for women and 58 for men was rejected in a referendum in 2011. In addition, the difference among the genders regarding life expectancy is still significant.The total fertility rate (TFR) in 2014 was estimated at 1.33 children born/woman, which is lower than the replacement rate of 2.1. The majority of children are born to unmarried women (in 2013, 58% of all births were outside marriage). In 2014, life expectancy was 77.83 years (74.21 years male, and 81.69 years female). 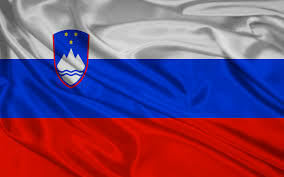 Slovenia has a developed economy and is per capita the richest of the Slavic states. The country was in the beginning of 2007 the first new member to introduce the euro as its currency, replacing the tolar. Since 2010, it has been member of the Organisation for Economic Co-operation and Development. 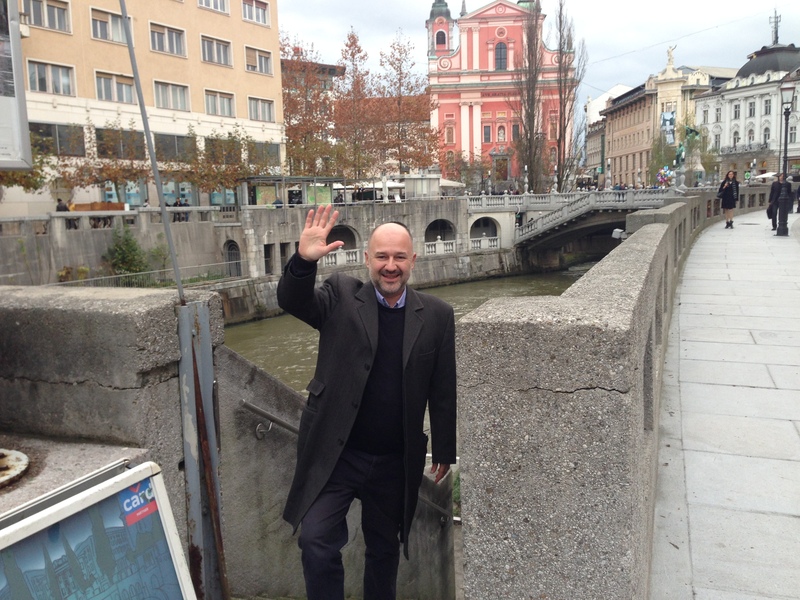 The linguist Silvo Torkar, who specializes in Slovene personal and place names, argued at the same place for the thesis that the name Ljubljana derives from Ljubija, the original name of the Ljubljanica River flowing through it, itself derived from the Old Slavic male name Ljubovid, “the one of a kind appearance”. The name Laibach, he claimed, was actually a hybrid of German and Slovene and derived from the same personal name. 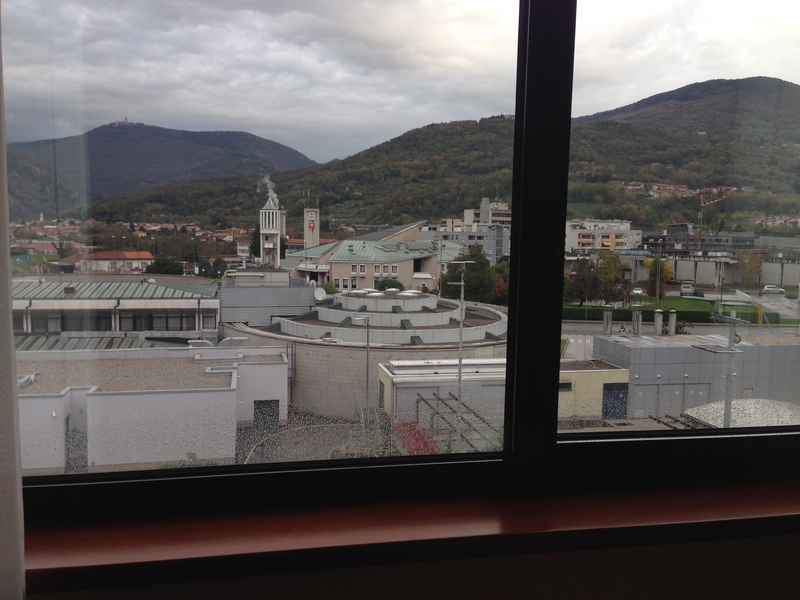 Nova Gorica (); population: 13,852 (town); 21,082 (incl. 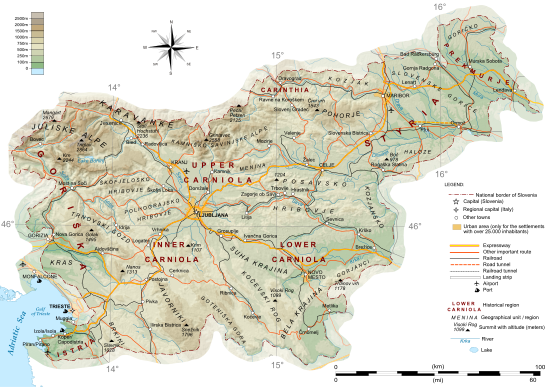 suburbs); 31,000 (municipality)) is a town and a municipality in western Slovenia, on the border with Italy. Nova Gorica is a new town, built according to the principles of modernist architecture after 1948, when the Paris Peace Treaty established a new border between Yugoslavia and Italy, leaving nearby Gorizia outside the borders of Yugoslavia and thus cutting off the Soča Valley, the Vipava Valley, and the northwestern Karst Plateau from their traditional regional urban centre. Nova Gorica is the principal urban centre of the traditional region of Goriška in the Slovenian Littoral. The Balkan Venture Forum is the largest venture capital private equity and investment forum in the region, created to facilitate access to finance, to improve investor readiness, to catalyze innovation into global business and to foster development of entrepreneurship capability. BkVF – COINVEST Edition is being implemented by Balkan Unlimited, COBIK, COINVEST, Europe Unlimited and the VIBE project. As a grass-roots initiative backed by entrepreneurs, investors, academics and policymakers from all Balkan countries, it is uniquely positioned as a truly open regional organizational framework for the integrated development of innovation and entrepreneurship cultures. The organizer of 25+ pitching events in Europe per year and the European Venture Summit Finals in Germany; founder of the International Venture Club, a global collaborative network of independent, corporate and institutional investors; and founder of the TechTour, Europe’s leading platform for growth stage entrepreneurs and investors. A privately funded research institution in bio-technology and open innovation systems; founder of the COINVEST -platform for connecting high-tech entrepreneurs and investors in New Europe; organizer of 30+ “investment readiness” workshops for entrepreneurs from South East Europe per year and annual COINVEST High-Tech Investment Conference in Slovenia; founder of specialized biotech incubator. Balkan Venture Forum is one of the main objectives of the SEE Programme project VIBE (Venture Initiative in Balkan Europe) and is co-financed by the European Union. Venture Initiative in Balkan Europe (VIBE) is a regional eco-system accelerator, supported by the European Commission with a budget of ~€1.7 million. The goals of VIBE are to address the challenge of developing the innovation and entrepreneurship system in SEE through a high-impact action of enabling a key financing process for innovation and entrepreneurship, which is crucial to the development of a knowledge-based economy in the SEE region. 16:30 EAST COAST OR WEST COAST – WHERE IS IT EASIER TO FUNDRAISE SMART MONEY IN THE US? 9:00 WHAT CAN A STARTUPPER EXPECT FROM AN ACCELERATOR? 11:15 HOW TO FUNDRAISE IF YOU ARE VC? 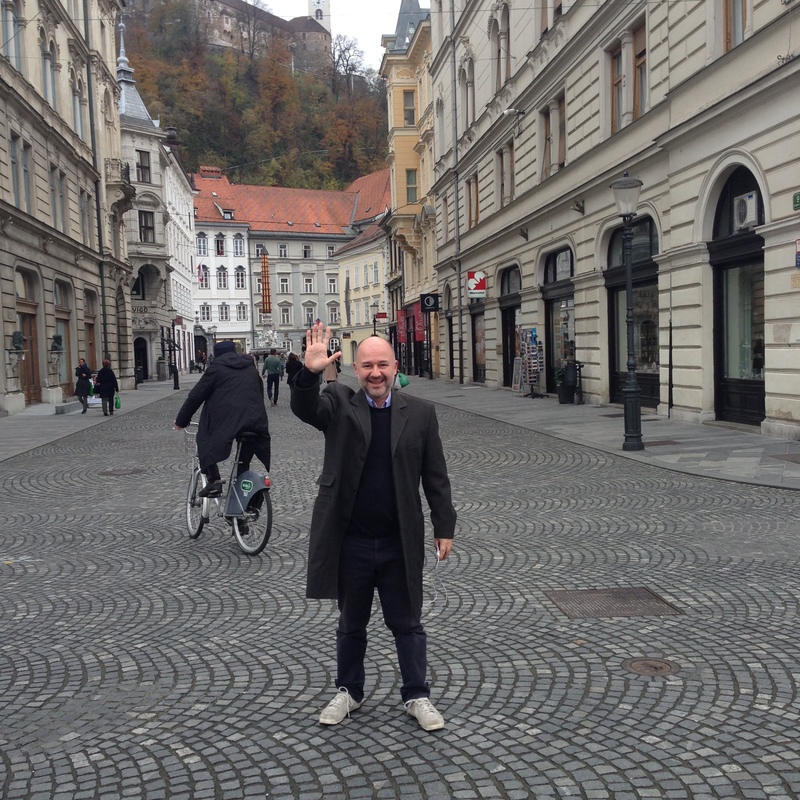 I arrived at the Ljubljana airport at 10:35 after a two-hour flight from Istanbul. The taxi I had ordered from the hotel was waiting for me. 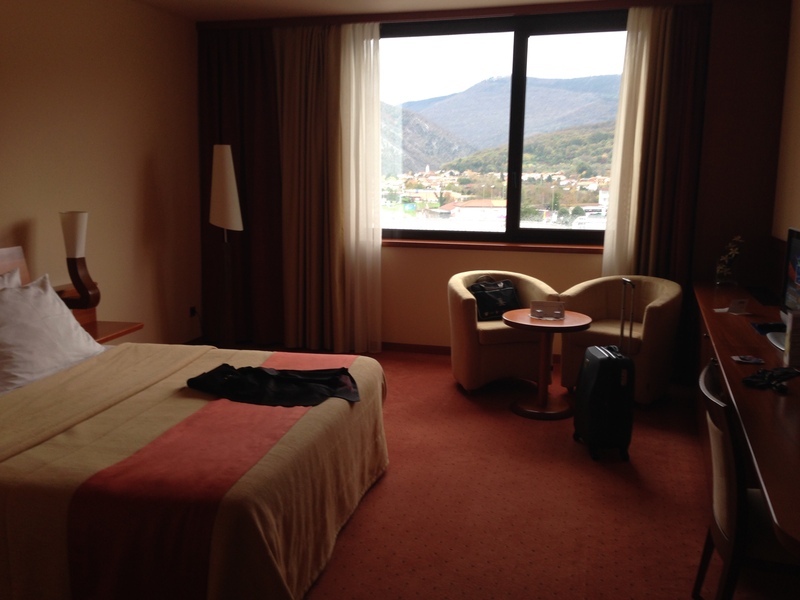 It cost 35 EUR from the airport to the downtown, taking half an hour to reach the hotel. 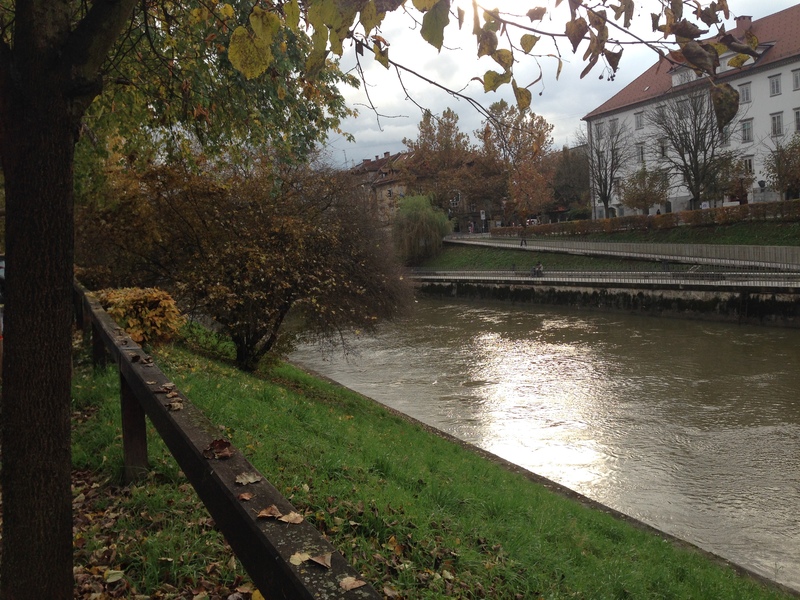 I had a pleasant coffee break by the river and by 5pm I was back at the hotel. Now it was time to check emails, do some social sharing and read the online news. I had reserved a massage for 6pm and I was on the 9th floor, where the spa center was. After a 1-hour massage (50 EURO, very reasonable), it was time to swim in the pool. By the way, the lady who made the massage was a living refrigerator but the massage was perfect. Highly recommended! After swimming, I went back to the room and changed my clothes to go out for a walk under a soft rain. It was a lovely rainy evening. I was back at the hotel by 10pm and fell asleep with my 3 pillows. I got up at 6am and was in the breakfast room by 7. What a crowded breakfast room it was! It was difficult to find a free chair. 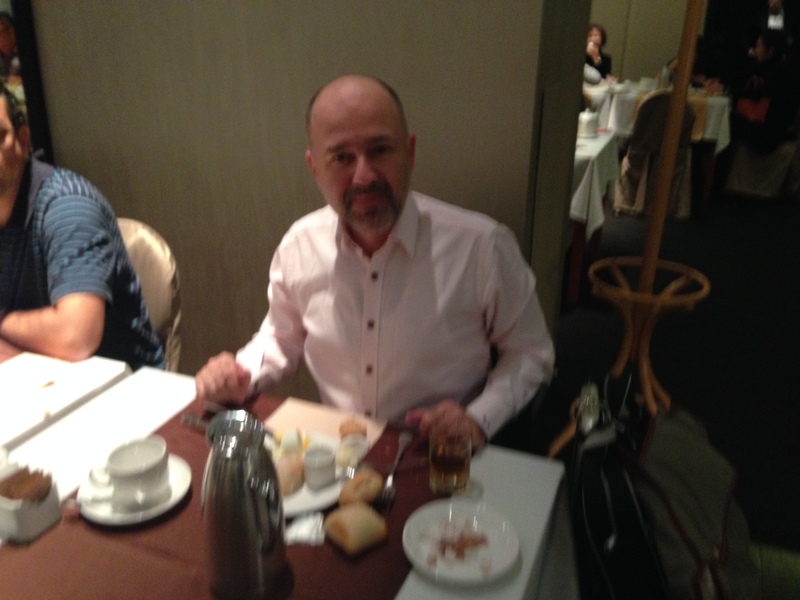 Breakfast was good and as usual, I took a cup of coffee in a paper cup and went to the reception to check out. Alexander Tasev had recommended this hotel and it was indeed very nice. If I come to this lovely city again, I will stay again in this hotel. The transfer service that Balkan Venture sent was waiting for me in front of the hotel. I received a message on my mobile that they would pick me up at 7:30am from the hotel. In the shuttle bus there were also 2 families who were going to Italy. One family was going to surprise their son on his birthday birthday. The son was studying in Scotland and he was going to celebrate his birthday with his girlfriend in Venice. His family agreed with hisgirl friend to make a surprise celebration for him and it was just 2.5 hours from Ljubljana to Venice. The other family, with two children, was going to Nova Gorica, like me. After a lovely 90-minute drive, I was at the Perla Hotel at 9am. The timing was perfect because the Balkan Venture Forum was scheduled to start at 9.30. The hotel was perfect, with a very big casino. The interesting side of this event was the forum was being held in the entertainment stage room of the casino. So, this became my first time to give a speech in a casino. My room number was 467. Those who have read my life story from my book ‘Off the Bus! Into a Supercar’ will remember how I made 2,500 USD in ten minutes and how I lost it in 10 minutes at a casino-like event when I was 16 years old. Since then, I have never bought even a lottery ticket. So, it felt rather nostalgic for me to pass by casino machines to reach the conference venue. After the opening speeches, I met with Michael Gold of Kosovo and Macedonia and chatted a bit about the up-coming December event in Istanbul. Then Alexander joined us until lunchtime. William, David, Andreas, Max, and many friends were at the forum, and it was very nice to see them all together in a small border city of Slovenia. Slovenia is a very green country — small, and very nice. The Turkish Airlines plane was the only one at the airport that morning, so I can’t claim there is a rush to the country, but this makes the country even more attractive for people who don’t enjoy crowds, like me. My speech was at 4.30 pm. Start an accredited angel investor system in Slovenia in the way it was done in Turkey. Create some tax incentives for accredited angel investors. Create a co-investment structure for start-ups with angel investors and public money. Convert the stock exchange to a platform where accredited angel investors and accredited start-ups come together. Convert stock exchange market to a school for start-ups. Allow foreign investors with proved successful exits to benefit from the tax incentives and co-investment structures. Then I immediately went to the casino-conference room for my speech. I then gave my speech on converting public money to smart money. Then we came together with friends at the coffee area of the hotel and moved on to the restaurant, where all participants were meeting up. After a chat with Michael, William and other friends at dinner, we went down to the first floor of the restaurant, where there was a DJ and music. While the music was playing, I found an opportunity to confirm a claim of a scientist that I had watched on a National Geographic Society programme. The claim was that men act faster and automatically spend more energy when there is an attractive female around. To confirm this claim, the National Geographic Society filmed ski-boardin teenagers on the street. When girls were passing, all ski-boarders were acting faster and trying to make more action. Unfortunately, I didn’t have the telephone of the National Geographic Society. If I had, I would have immediately invited them to our dancing club. When the blonde lady went to the rest-room, all the men stopped dancing and rested. So, the lady’s visit to rest-room meant a ‘rest-now’ session for the men:) When men saw the head of the blonde lady (not the whole body), even at that second they immediately starting dancing. I think this would be a perfect re-confirmation of the claims of the scientists. I left the bar at 1am and was in bed fifteen minutes later. The hotel and restaurant were very close to each other. Guess what happened! No hard pillow at the hotel! Guess what happened! I couldn’t get to sleep until 5:30 and then I had to get up 6:30 because I had a meeting at 7 with the Super Founders team in the breakfast room. At the breakfast meeting, we discussed the main structure of our 50 million EUR fund and outlined the main key points to be discussed with a Turkish bank who had committed to contribute 25 million EUR to our fund. We are going to market at the meeting in Istanbul on the 16th of December and all Super Founders Team will be in Istanbul for this important meeting. The airport transfer service was ready at 8:30am and I was at the airport by 9.30 for my 11:30 flight to Istanbul. 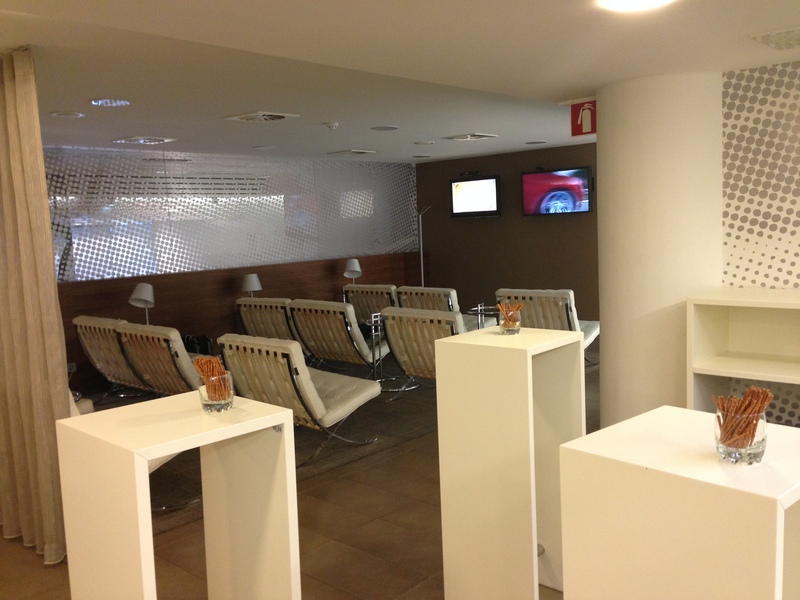 Just a quick note: Slovenia is a lovely place, but I can’t say the same for the CIP Lounge of the airport. It is one of the worst I have ever seen. It is designed like a train station waiting lounge in a third class village. I’d like to congratulate Aleksander Tasev for his great work and effort. He is really fostering the South East Europe’s entrepreneurship ecosystem with all his effort. Good news! The next Balkan Venture Forum will be in Pristina next May and I will give the opening speech of the second day of the Forum in Kosovo. Thanks Michael, and thanks William for your invitations. See you in Kosovo in May! 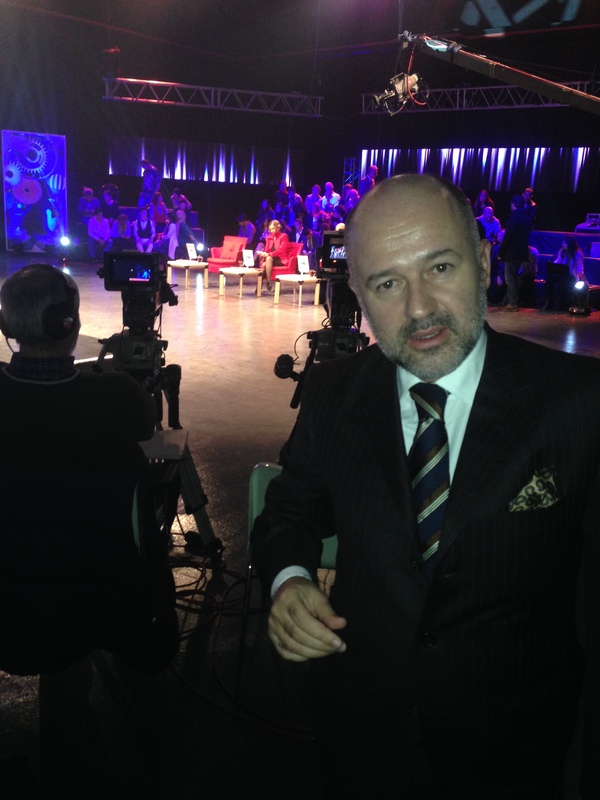 I landed in Istanbul at 2:45 and I was in the studio by 3.30 for my weekly TV show. The show was planned to be filmed between 3:30 and 6:00 but it didn’t happen like that and it was 9:20pm when I left the studio. Please don’t forget that I had been able to sleep only 1 hour in the past 24 hours, and after leaving the studio I took the 1:20am flight of Turkish Airlines to Adana, where I would go to my summer house to sleep for a few days – because 48 hours later I had to fly to Helsinki for the board meeting of EBAN and EBAN Winter University Conference.